As you can see, the joint I described at great length there wasn’t nearly as good as I thought. It has a nice wetted spot in the middle, but the rest of the joint didn’t bond. 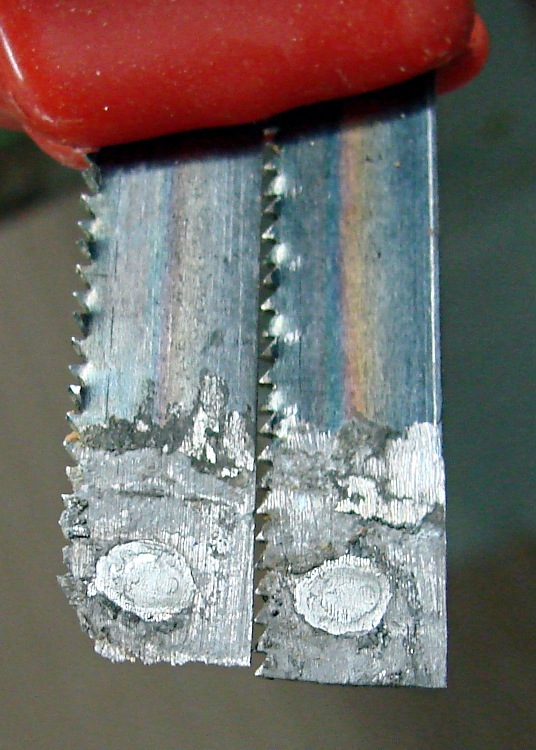 Alas, the ends of the blade sections had just enough molten solder to look as though they were bonded. I’ve done other joints with that resistance soldering unit which held up well, but I’ll cheerfully admit I don’t have years of deep experience with it. Given the effort involved in making a bandsaw blade joint (not to mention the fact that I only solder up a new blade when I really need one), this is the first destructive test I’ve seen. It’s not like I’m going to solder up a blade, then tear it apart just to see how it worked, as I did with the nickel strip on those AA cells there. A change of technique seems in order. The carbon electrode produces enough heat directly under it (which isn’t surprising, that’s how resistance soldering works), so I must cover the full joint area with enough oomph to get a good bond everywhere. That seems to be 1.5 seconds per zap, more or less, repeated as needed. I have some machinable graphite that I could cut to be one square bandsaw joint at the end, plus a stub from a searchlight electrode that might work with less overall effort. However, a larger electrode probably wouldn’t heat the joint enough to melt the solder everywhere at once. For what it’s worth, I tried to re-solder the joint without doing full surface preparation by grinding down to bare steel. Didn’t work, natch, which should come as no surprise; wasted half an hour futzing around before I gave up and did it right. Memo to Self: Use the carbon gouging rod electrode, hit the entire joint, and don’t move until each zap cools!